The BABYBJORN Bouncer Balance Soft is a versatile baby accessory which provides safety, support and comfort. Made with an ergonomic structure, it is ideal for use both at home and in your office. Capable of a natural bouncing ability, this bouncer supports your baby's head and back in a healthy way. Moreover, it can be used for newborns and children up to 2 years old. The bouncer is made of soft fabric which is easy to clean in your washing machine. Furthermore, the fabric is safe and made of a material which is free of hazardous materials. Hence, your baby can chew on it with no adverse effects. After considering its already impressive features, is the BABYBJORN Bouncer Balance Soft really worth your attention? Read on to find out. What makes the BABYBJORN Bouncer Balance Soft unique? This bouncer requires no batteries to run. 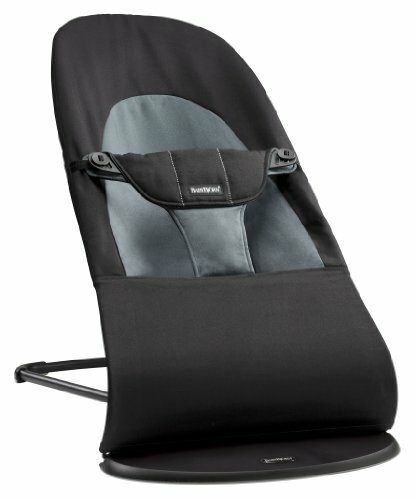 Designed to be ergonomic and soft, the bouncer only requires movement by the baby to bounce it. It automatically responds to any movements that your baby performs and begins to bounce. After your child learns to stand and walk, they can still use the bouncer as a chair. The bouncer has a maximum weight capacity of 20lbs (9 kg) while the chair can hold a maximum of 29lbs (13 kg). Seeing as the bouncer does not require any batteries to run, the baby moves it with their movements. Over time, the little one learns how to rock the bouncer on their own. By making the initiative to do this, they develop motor skills and balance too. As such, it is a comfortable accessory which assists with child development. The head, neck and spine are very important parts of a baby's body. The BABYBJORN Bouncer Balance Soft is able to support these parts of your child. Furthermore, the fabric seat normally molds itself to fit your child's body shape. It also distributes their weight evenly for more comfort. These characteristics contribute to the normal growth of your child's muscles. After playing with the bouncer for a while, your baby is bound to feel sleepy. Thankfully, the bouncer has positions which are suitable for play, rest, sleep and transport. You can easily adjust it from one position to the other. When not in use, the bouncer can be folded and conveniently stored away. To ensure maximized comfort, the BABYBJORN Bouncer Balance Soft has curves and rounded edges. Not only do they create a cozy spot where your baby can relax, it is snug and guaranteed to relax them into a deep sleep. Furthermore, the device has a safety harness that keeps them in the bouncer. The same acts as a spot that your baby can hold while rocking. This bouncer is made of soft fabrics that cannot irritate your child's skin. Furthermore, these fabrics are easy to clean in your washing machine. As a mark of approval, the materials used to construct this bouncer are certified by the Oeko-Tex Standard 100, Class 1. This is an important feature which promotes your child's safety and health. The BABYBJORN Bouncer Balance Soft is certified by JPMA. This shows that it is snug, ergonomic and safe for your baby to use. It was also developed with the assistance of pediatricians. They contributed expert opinion to ensure that the bouncer provides support for your baby's head, neck and back too. Furthermore, the expert opinion of midwives and child psychologists was sought during the design of this bouncer. For your child's entertainment, the bouncer can easily be accessorized with a Flying Friends Toy. Featuring some rotating figures, the toy can definitely put a smile on your baby's face. Bought separately, this accessory helps your child to play, discover their physical capability and develop motor skills too. Question: Can I buy the BABYBJORN Bouncer Balance Soft for my 5 month old baby? Do older babies enjoy it? Answer: Yes, you can buy it. Even babies as old as 2 years can still enjoy using the bouncer. Question: Can a 1 month old newborn use it at the rest position without extra head support? Answer: Yes, you can use it without one. The baby will still be comfortable and healthy. Question: Is the bouncer easy to carry from one spot to another? Answer: Yes, the bouncer can be transported quite easily from one location to another because it folds completely flat and is light too. The BABYBJORN Bouncer Balance Soft is one of the most ideal baby accessories today. Not only does it provide a snug sleeping cot, it also acts as a chair for older children. Made of safe, easy to clean materials, it is adapted for babies. There are no batteries required for it to work. Affordable and versatile, it is worth your time, attention and money.